Andrew Masullo, 5811, 2013, oil on canvas, 20 x 24". In an art world glutted with gratuitously large abstract painting, a compact canvas can say more than those the size of billboards. Of the twenty pieces in Andrew Masullo’s exuberant exhibition “Recent Paintings,” none measures more than three feet tall, and most are two or less. Their high-keyed Crayola colors and lobed, undulating shapes evoke Matisse cut-outs, but Masullo’s works are deeply concerned with oil paint. 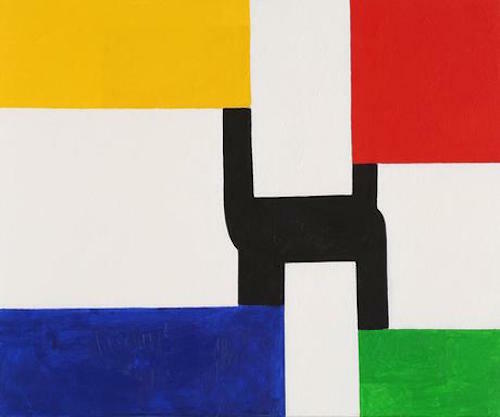 His investigation of texture, translucency, and the intimate complexities within a nonobjective realm of loose geometry recalls certain works by Stanley Whitney and Mary Heilmann. Dark, palimpsestic shapes lurk beneath the yellow and green rectangles in opposite corners of 5811 (all works cited, 2013): shadows of the painting’s metamorphosis. A third corner rectangle is red, matte, and opaque, while a fourth is blue, glossy, sheer, and buzzing with brushwork. These distinctions in viscosity and finish become oddly monumental, given the work’s restrained palette and scale. The boundaries separating colors begin to vibrate as one lingers with Masullo’s paintings. A frayed border between white and blue reveals a pink underpainting whispering through the crack. When the paintings flop (few do), it is because they lack this internal alchemy. Too slick and they can feel slightly patronizing. 5809, a blandly cheerful gathering of wavy blobs, could decorate a pediatrician’s office. All the works, however, exude a serene self-possession, born of the artist’s intuitive process. Masullo will spend years reinventing a single canvas, and each piece contains many paintings. These former selves—glimmering through a semitransparent surface or buried away completely—make Masullo’s work feel unexpectedly human.